It’s been a hot week, needing summer food. These salmon and spinach fishcakes hit the spot. Yes you have to put the oven on to cook them but they can be prepared ahead of time and then served hot or cold. They also freeze well, I always mean to make extra for this purpose but then the kids eat them all! I must admit to my brain needing a kick start to come up with ideas for summer food. My family aren’t huge salad lovers, so all those beautiful salads that my mind fancies have to take a step back. It is like digging up buried treasure, deep in the recesses of my dusty brain were recipes I haven’t made for well over a year. This was one of them. The hardest part about these is getting the breadcrumbs on them, which really even my toddler can do. In fact, maybe next time I should get the kids to cook these and sit down with a cuppa. The salmon provides a great source of omega 3’s needed for brain development and cognitive function, heart health and reduction of inflammation. They can be beneficial in rheumatoid arthritis and depression. It is recommended that we eat 2 portions of fish a week of which one should be healthy. I try to ensure my family get 1 portion a week in their evening meal and it is usually salmon that we favour. I’ve used tinned salmon for ease in these, to save extra faff and cooking. Spinach is a great source of Vitamin K, Vitamin A (in the form of carotenoids), manganese, folate, magnesium, iron, vitamin B2, vitamin B6, vitamin E, calcium, potassium and vitamin C. It is a source of dietary fibre, phosphorus, vitamin B1, zinc. Using frozen spinach again saved cooking and I find it easier in dishes like this. Frozen spinach is such a versatile and great ingredient to have on standby. If you don’t have frozen spinach in your life, go and get some. So the iron and omega 3 content also make this recipe a great one for pregnant ladies and for toddlers. A great family meal, one where you can cook just the one meal for all. I served ours with courgetti cooked in the wok with lemon juice and garlic, plus homemade coleslaw. Wash the potatoes, cut into small chunk and boil. Add the frozen spinach for the last few minutes. When soft mash the potato and spinach, leave to cool. Mix in the salmon, mustard and lemon juice, parsley, chives and seasoning. Now comes the fun part, shape into patties with your hands. Now you can leave these to chill until you want to cook, freeze them or cook straight away. Cook at Gas Mark 6 for 10-15 minutes. 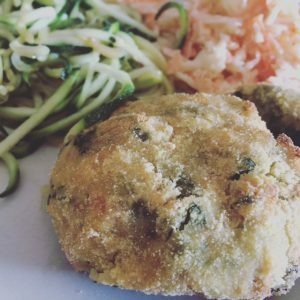 I used bought breadcrumbs for the family, as they were in the cupboard and then I used cornmeal for my own fishcakes to make them wheat free. The picture above is of my wheat free fishcake with the polenta crumb.